This was my 1st time dining at a three Michelin-starred restaurant, since my dining companion and I ate at Joël Robuchon Restaurant before the inaugural edition of Michelin Guide Singapore. Other than making sure we reserved seats early enough, was also reminded to bring appropriate wear lest we are denied entry – was politely told Sophia's restaurant at The Charles Hotel, Munich was full when I was underdressed. 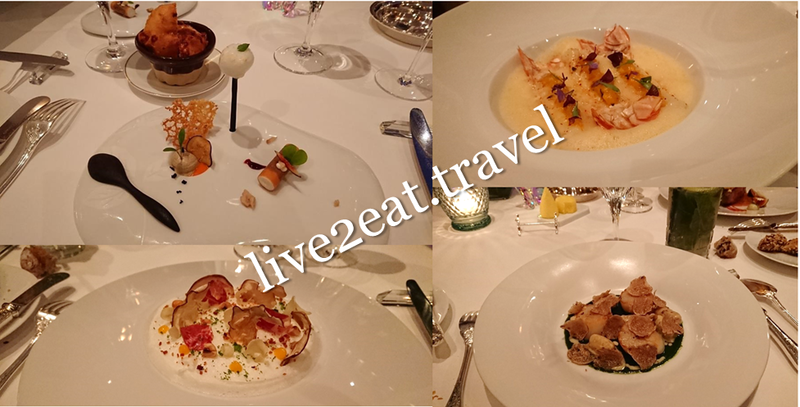 Stepping into the luxurious Le Bristol hotel where the beautiful Epicure is located, we were ushered to the restaurant that has held its three Michelin stars since 2009. After offering to take my jacket (and remembering to return it to me as we were leaving), we were brought to our table overlooking an exquisite garden. Fret not if you do not understand French as the staff speak English, just like at Fischers Fritz and Seta. Their recommendations were good too and service impeccable. No complaints about the variety of warm breads, and my choice of a seaweed one with crispy crust and soft insides. Amuse bouche by celebrity chef Éric Fréchon was a lovely start that set our expectations for the rest of the meal. My dining companion was full of rave for the succulent Large Langoustines lightly-cooked with lemon-thyme, onion mango and condiments in broth of the claws with citrus fruits and coriander but not as much for the main course of Sea Scallops – ratte, potato gnocchi with white truffle (the season has started though I found it a tad bland) from Alba and watercress juice with brown butter. For my order of Hen Egg, I was recommended to spoon the "blanc manger" through to the egg yolk in the center and parsley juice with brown butter at the bottom, and eat as a mouthful with the shaved Pata Negra, raw and cooked cep mushrooms on top. A delicate burst of flavours and textures that came well together. Decided against Our Royal Style Hare, which the staff felt could be too gamely for me since I have not tried the meat before and find lamb/mutton too gamely. Instead, I chose Duck from Challans which was roasted just right so it had a crisp crust with tender and not tough insides. Topped with spicy honey and crushed favours, served with sweet figs, puréed onions with verbena, and delicious souffléed potatoes. The pre-dessert to cleanse our palate was a refreshing sorbet with mango. Loved our dessert of "Thyme-Lemon" Honey – iced, crispy and runny honeycomb, refreshed pears with lime. 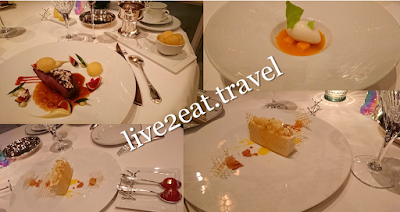 It was sweet yet not cloying due to the different forms of honey, and tart cubes of pears topped with gold foil. Just when we thought we were too full to stomach any more food, a silver chest was wheeled over. The doors opened and drawers pulled out to reveal petite fours so pretty we could not resist having two pieces each. Yummy!